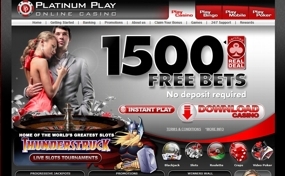 Platinum Play is an online casino launched in 2004 and is a part of the Fortune Lounge Group of Online Casinos. This group is known as one of the most reputable and experienced ones. You’ll find 390 games including slots, table, card games as well as some more exotic ones. All games are available in two versions of play, either an instant version or a downloadable one. When it comes to treating players, there’s an exclusive offer up for grabs – new players can take advantage of 1,500 free bets and win real money without even making a deposit! Platinum Play Casino is powered by MicroGaming – industry leaders in online gambling software market. 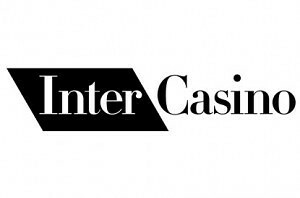 Casino can be played by either launching the instant play version or downloading the client. If you’re a user of Mac or Linux powered computer, the first one will be a greater fit, while Windows users will be able to use the full functionality of the downloadable version. The games offered by Platinum Play are of highest quality in terms of graphics, functionality and overall user experience provided. Users of mobile devices can also take advantage of the mobile casino that allows iPhone, iPad and Android powered device users to enjoy a handful of games directly from their portable devices. The Dark Knight – challenge Batman himself on this recently launched slot game that offers a progressive jackpot, free spins feature and of course a progressive jackpot, which exceeds £5 million as we speak. Immortal Romance – Twilight was a big hit movie, so is this slot machine. Once again it offers the latest addition of MG slots, 243 ways to win that is. Mega Moolah – the best known progressive slot game on the network. Play this 25 pay line slot machine at Platinum Play Casino and claim the multi million progressive jackpot by spinning the bonus wheel! King Cashalot – 5 reel, 9 pay-line machine created in the them of King Arthur. This multi coin progressive slot machine is loaded with functions and exciting features. Fruit Fiesta – a slot game that emphasis something in between of modern video slots and fruit machines. It’s a 5 reel, 15 pay-line slot machine that offers free spins and progressive jackpot on top of it! 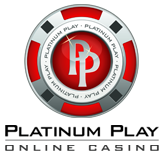 There are two bonuses that you can take advantage of as a new player who is joining Platinum Play Casino. The first one is a no deposit offer of free 1,500 casino credits. You can use these credits at all slot games offered and keep your winnings! Please not that you’ll have to wager 40x the amount you win, before any withdrawals requests can be approved. The second is a 100% match bonus up to $200, added to your account in 10 credit increments as you play games for real money. This bonus features a play-through requirement of 30 times the bonus amount. Some games, while will count towards the requirements, will only do so as a percentage of the total wagers made on them. 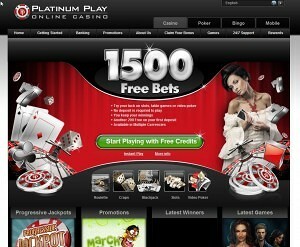 Join Platinum Play and claim your 1,500 in free casino credits now!